November is a great recreational fishing month in the Northeast. Species to target include tautog, black sea bass and, for the past two years, recreational cod fishing has been very good off Rhode Island. Cod fishing was so good last fall and winter that many recreational anglers fished for them (even from shore) until the end of December, as the weather was mild. All three of these species have had management plans for years. Thanks to a strong Magnuson-Stevens Act, the regional councils, the Atlantic States Marine Fisheries Commission and an excellent state fisheries program we can enjoy fishing, catching and eating cod, tautog and black sea bass. Cod fishing was strong last year and has been good so far this year. Cod fish were caught at Cox’s Ledge (about 20 miles south/southeast of Pt. Judith, RI) all summer long, and last year we had a good cod bite at the East Fishing Grounds (three miles east of Block Island) as well as some places off Newport. Anglers were catching cod close to shore last year near reefs, rock clusters and structure like sand bars close to beaches. Many fish were caught when anglers were tautog fishing. Cod are bottom fish that are basically lazy. They are not aggressively hunting; they pretty much stay on the bottom, often near structure (underwater wrecks, rock piles, holes, humps and drop offs), waiting for prey to come by. So you have to go to where the cod are to catch them. They are not likely going to come to you. A hook, sinker weight that holds the bottom and sea clams are often used as bait to catch cod. Jigs of various sizes, color and weight depending on conditions are used too. The minimum size for cod in state Rhode Island waters is 22″ with a ten fish/person/day limit. Cod is overfished and over fishing is occurring; however, the Rhode Island quota was not reached in 2016 so fish managers may allow effort to increase above current levels in 2017. 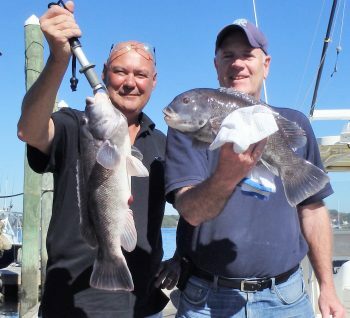 Rick Croteau and Jim Malachowski caught tautog to 23 inches off Newport. The tautog bite there was good through November last year. 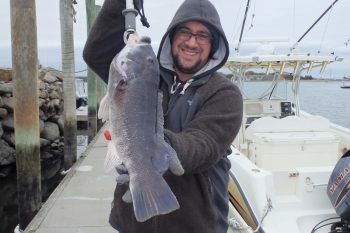 Tautog are master bait stealers and can be elusive. Often times one angler may be catching fish and another one three feet away may not be catching fish. And when the bite is on you can go through a lot of crabs to land your limit of keepers. The minimum legal size in Rhode Island is 16″ with a six fish/person/day limit for the fall/winter season. However, a ten fish per boat limit applies for private boats (does not apply to charter/party boats). Presently tautog overfishing is occurring; however fishing morality rates have increased above the overfishing threshold so fish managers are suggesting we maintain effort at or below 2016 levels for 2017. Tautog rigs should be kept simple. My favorite rig is homemade. I use one tautog hook connected to a swivel with a two or three ounce egg sinker on top sliding on a small three to four inch piece of monofilament line. Another swivel above the egg sinker connects the monofilament and the braid line (30 lbs.) coming from the rod/reel. Since I have started using this rig, bottom tie-ups have been cut in half. Braid line does not stretch, so this is my preference, whereas monofilament line may stretch allowing the tautog to reach structure. 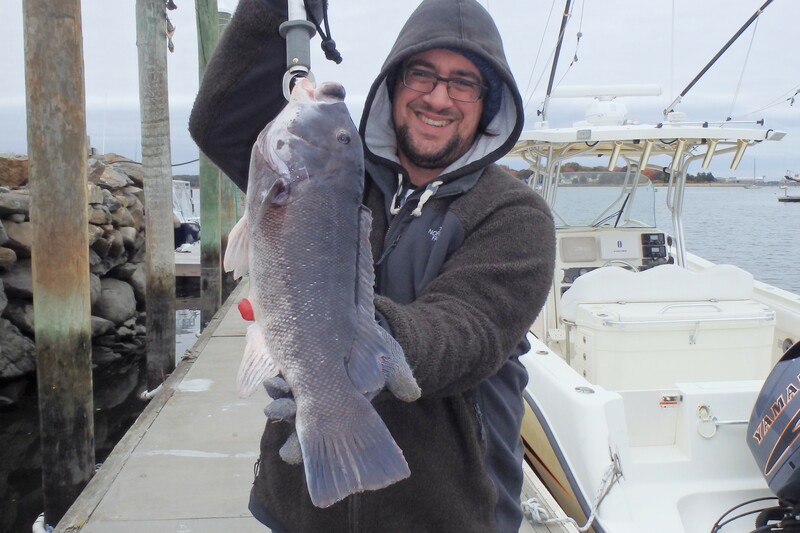 Last November Geoff Monti of Westerly, RI had no trouble hooking multiple tautog with Capt. Monti’s tautog finder… a special egg sinker rig that uses laser sharp hooks and reduces bottom tie-ups by 50%. When fishing for tautog from shore, look for rocky coastline (if in Rhode Island this would include places like Beavertail Point, Jamestown; locations off Newport; the rocky shore line off Point Judith; and off jetties along the southern coastal shore). Docks, piers, bridges are good structures too. From a boat in Rhode Island, I have had good luck at Conimicut Light, Plum Point light house next to the Jamestown Bridge, the jetty at Coddington Cove in Portsmouth, off Hope Island, around Brenton Reef and Seal Ledge in Newport, Whale Rock, Ohio Ledge in the East Passage, General Rock in North Kingstown and any other places there is structure, debris, rock clusters, wrecks, mussel beds, etc. Another key factor is water movement, so a couple of hours before or after high or low tide is good. 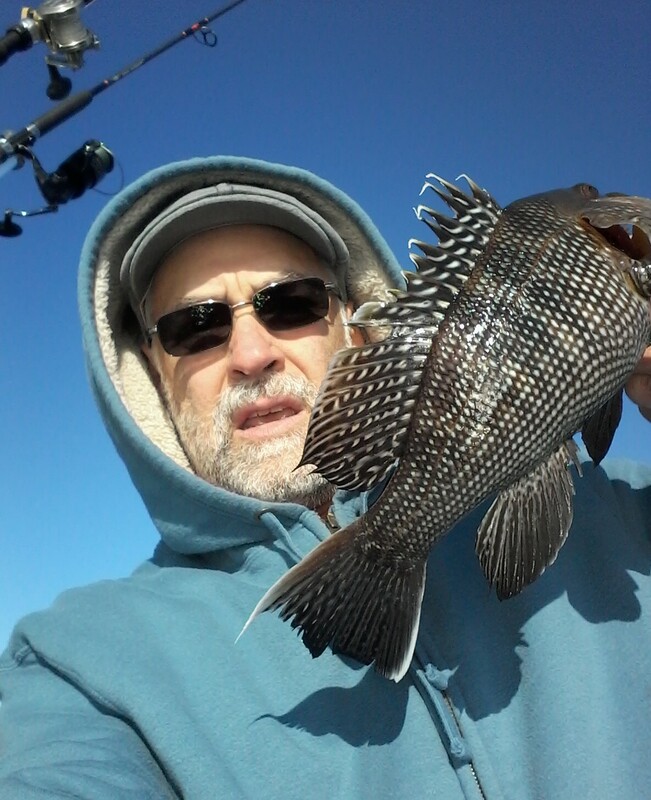 Kevin Fetzer with a black sea bass caught off Block Island last November. Black sea bass are easy to catch so they are good to target with children and anglers at all skill levels… and they are a very tasty fish to eat too. Use a quick hook set when fishing for black sea bass. Although a sea bass has a large mouth, use a small #2 bait-holder hook tied above a small sinker; this fish normally hesitates to grab bait strung on large hooks. The smaller piece of bait ensures that the fish will put its mouth on the bait/hook rather than pulling a larger piece of bait off the hook. Rigs often used to catch black sea bass have two hooks set-up 12″ to 16″ apart with a bank sinker to hold bottom. Squid or sea clams are often used as bait. Anglers often catch them while fishing for fluke, cod or tautog, because you are on the bottom and likely fishing with squid, clams or crabs (all baits that sea bass like to eat). Any underwater structure… rocks, wrecks, piers and jetties will attract black sea bass. The larger males are generally found in deeper water. A new black sea bass stock assessment should be complete for use in 2017, as of now it is recommended that effort be maintained at or below 2016 levels. The minimum size in Rhode Island state waters is 15″ with a seven fish/person/day limit. The cod regulations seem to be working to increase the numbers of fish. I hope to see the same improvements in the numbers of tautog and black sea bass with continued adjustments to quotas and size limit. Really is gorgeous. I agree with you. It catches my attention right away. O how I love travelling that involves sunset.